Officials in Brazil have blamed lack of funding for a huge fire that has ravaged the country's National Museum. 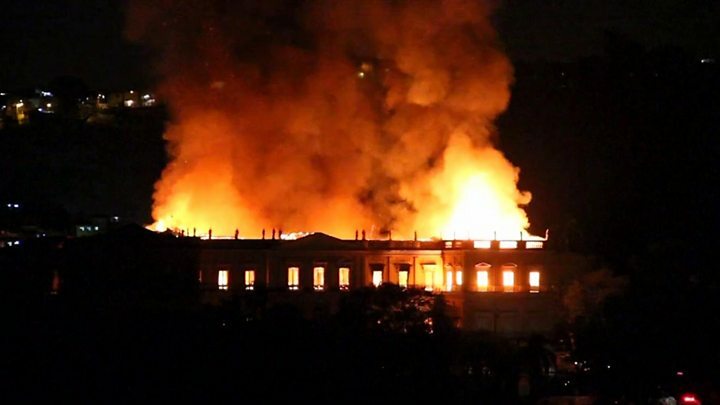 One of the largest anthropology and natural history collections in the Americas was almost totally destroyed in Sunday's fire in Rio de Janeiro. This included the 12,000-year-old remains of a woman known as "Luzia" - the oldest discovered in Latin America. There had also been a string of complaints about the dilapidated state of the 200-year-old museum. "We never had adequate support," its deputy director said after the fire. Experts had warned for years of a serious fire risk to the building. Image caption The museum director said "Luzia is a priceless loss for everyone interested in civilization"
Presidential candidate Marina Silva criticised lack of investment. "Given the financial straits of the Federal University of Rio de Janeiro and all the other public universities the last three years, this was a tragedy that could be seen coming," Ms Silva, a left-wing politician standing in next month's election, tweeted. The fire started on Sunday evening, after the building - a 19th Century former royal palace - closed for the day. The cause is not known, but Culture Minister Sergio Sa Leitao was quoted in Brazilian media as saying it may have been ignited by a small paper hot air balloon landing on the roof. No injuries have been reported but most of the 20 million items the museum contained went up in flames. Brazil's President Michel Temer said in a tweet that it was a "sad day for all Brazilians" as "200 years of work, research and knowledge were lost". Mr Sa Leitao said it was a "tragedy that could have been avoided" but a reconstruction effort would begin. Prof Paulo Buckup, an expert in fish science at the museum, arrived at 19:30 (22:30 GMT) local time to find parts of the building where animal specimens were kept still intact. "It's unfortunate but the firefighters were not in a position to do anything, to fight anything," he told BBC Brasil's Julia Carneiro. "They had no water, no ladders, no equipment. "So we took the initiative to get in to try and save what we could. We had to break down doors. The soldiers helped us carry things." Prof Buckup rushed into the burning building to save its extensive collection of molluscs rescuing "a few thousand" specimens, a "tiny" part of the collection. "I don't know how many tens of thousands of insects and crustaceans were lost," he says. "I feel very sorry for my colleagues, some of whom have worked here for 30 or 40 years. Now all evidence of their work is lost, their lives have lost meaning, too." A deputy director at the museum, Luiz Fernando Dias Duarte, expressed "immense anger", and accused Brazilian authorities of a "lack of attention". "We fought years ago, in different governments, to obtain resources to adequately preserve everything that was destroyed today." Demonstrators gathered at the gates of the museum on Monday morning, protesting against the budget cuts that they blame for the fire. Police were seen firing tear gas. One issue appears to be the lack of a sprinkler system. Mr Dias Duarte told Globo TV that a $5.3m (£4.1m) modernisation plan agreed in June would have included the installation of modern fire prevention equipment, but only after October's elections. A major dinosaur exhibition, which was forced to shut following a termite attack five months ago, had recently reopened only thanks to a crowdfunding campaign. Museum librarian Edson Vargas da Silva told local media that the building had wooden floors and contained "a lot of things that burn very fast", such as paper documents. Why the lack of funds? The museum, Brazil's oldest, is managed by the Federal University of Rio de Janeiro and the federal government has been struggling with huge budget imbalances in recent years. The deficit was about 8% of GDP in 2017, only slightly down from a record 10% two years earlier. But Rio de Janeiro state is also facing a budget crisis. The pale yellow building is still standing - but the windows are burned out, the roof has gone and its insides are black. Throughout the day, firefighters, investigators and even museum staff have been going into the building and every so often they have brought out bits of artefacts or anything they think they can salvage from the rubble. Hundreds of people gathered outside, watching the developments - many of them in tears. Some researchers and academics I spoke to said they were still hopeful that some material on the ground floor could be saved - that is if it hadn't been crushed by the force of the upper floors collapsing on top of it. With their knowledge of where the archives were kept, they've been tipping off firefighters on where to go to rescue material in the hope that at least some of Brazil's most important history can be saved. Its 20 million artefacts included fossils and dinosaur bones. The jewel in the crown for many visitors was "Luzia". "Luzia is a priceless loss for everyone interested in civilization," museum director Paulo Knauss told the AFP news agency. Using her skull, experts had produced a digital image of her face, which was used as the base for a sculpture that was also gutted by the fire. Another popular exhibit was the Bendegó meteorite, weighing more than five tonnes and discovered in Bahía state in the 18th Century. Images taken in the aftermath suggest it is still intact. The ethnology collection had unique pieces from the pre-Columbian era and artefacts from indigenous cultures. Portugal's royal family transferred the court to the building in 1808, when the country faced the threat of invasion from Napoleon.